Three new beaches would be on the map of Visakha tourism by the end of this year as Visakhapatnam Urban Development Authority (VUDA) is planning to develop the beaches on the Visakha- Bheemili stretch soon. The beaches would be developed by adhering to the CRZ (Coastal Regulation Zones) rules, Vuda officials said. The Visakhapatnam urban development authority would provide basic infrastructure and facilities at the junction on the beach road at Rushikonda IT Park, Ramanaidu studio and the main entrance of Thotlakonda area. The vice-chairman of the urban development authority and his team inspected these areas on Tuesday. They said that the designs and proposals for the development of all the three proposed beaches would be submitted in a week to the authorities concerned. The municipal authorities would also provide parking and lighting facilities at these beaches and the beaches would be ready before the inauguration of the Visakha Utsav to be held in December this year. This beach is located 13 kms. 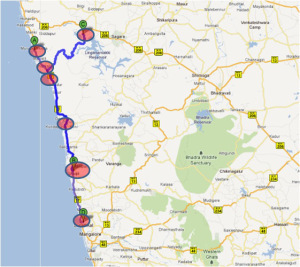 from Visakhapatnam and is an ideal tourist destination. Rishikonda is a thickly covered hill. This lovely beach with golden sands and vast stretches of water is the best beach in Vizag. It is an ideal destination for lovers of nature especially water sport enthusiasts. Tourists can enjoy water skiing, sunbathing, wind surfing and swimming. The tourist complex here is well equipped with a tourist lodge, individual rental cottages, a restaurant and other amenities. The 14th century Sri Sapta Rusheswara Temple surrounded by seven hills is located in Rishikonda. Rama Krishna Beach also known as R.K. Beach is located on the east coast at a distance of about 5 km from the centre of the city. This beach occupies the largest part of the seafront and is a great spot to spend leisure time. 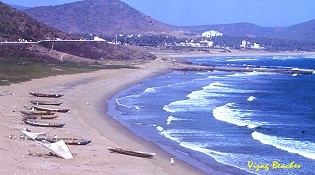 The R.K. Beach was jointly developed by the Municipal Corporation of Visakhapatnam (MCV) and the VUDA. Lawson’s Bay Beach with golden sands and lush green vegetation is located a little ahead of the RK Beach on the way to Kailasagiri Hill. The shallow crystal clear water of the beach is ideal for sea bathing and surfing. Sometimes known as Peddawaltair Beach, it presents a picturesque and scenic beauty of nature. The beautiful beach at Bheemunipatnam also known as Bheemli, located at the mouth of the river Gosthani, is considered to be one of the safest and calmest beaches for swimmers. The beach with its invigorating climate coupled with the pleasantness provided by the lush green palm groves makes it a popular sea side resort. Yarada Beach, located 15 kms away from Vizag city offers a fabulous landscape with its exotic blend of golden sands and the lush green stretch of hills. Nestled between the hills on all the three sides and the Bay of Bengal on one side, this beach could be an ideal spot for a day out. The beautiful Gangavaram Beach, lined with palm trees is located near the Visakhapatnam Steel Plant (VSP), at a distance of about 26 kms south of Vizag. The beach has a beautiful coastline which attracts number of tourists and film makers.